Britain’s biggest housebuilder is celebrating a record year after cashing in on the taxpayer-funded Help to Buy scheme. 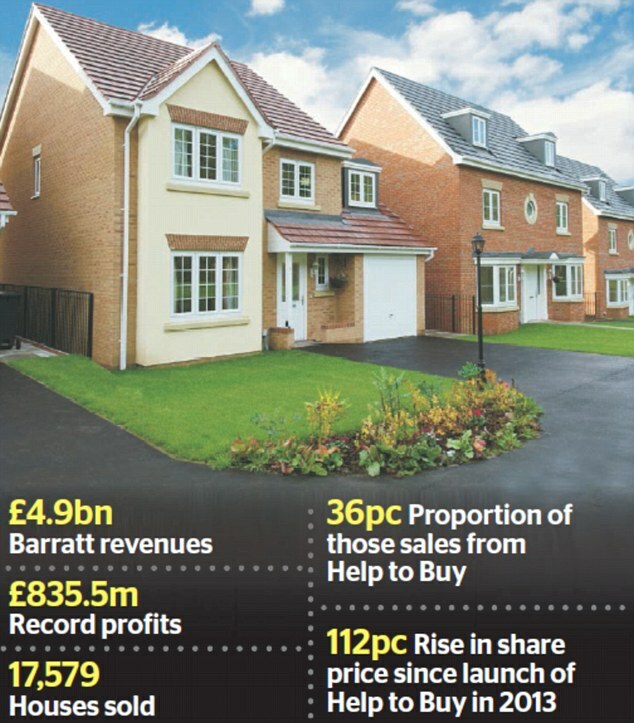 Barratt Developments raked in profits of £835.5million in the 12 months to June 30 – up 9 per cent on the previous year and the equivalent of £95,000 an hour. The company sold 17,579 new build homes, just 184 more than a year earlier, generating revenues of £4.9billion. Barratt said more than 6,300 homes –or around 36 per cent – were bought through Help to Buy. The scheme offers buyers of new-build homes taxpayer loans to help them get on the housing ladder. Nearly 170,000 properties have been sold through the programme since it was launched in 2013 – although a fifth of families were not first-time buyers and used the loans to buy a bigger home. Critics argue that the scheme pushes up house prices, is increasingly used by the better off, and has left struggling families further away from the dream of owning a home. But David Thomas, Barratt’s chief executive, joined calls among housebuilders for the existing scheme to be extended. He said: ‘In terms of what the Government set out to deliver with Help to Buy, I think it is ‘tick, tick, tick’. ‘You have 170,000 buyers who have purchased homes using the scheme and housebuilding has also been a big driver of GDP. The Prime Minister has said housebuilding is the number one domestic priority and she has set a target of 300,000 homes a year. ‘So coming from a current base of around 217,000, we are going to have to deliver 50 per cent more homes to meet that target. His comments came just a day after Redrow boss Steve Morgan described Help to Buy as a ‘godsend’ and said scrapping it would be ‘crazy’. Barratt warned investors that an end to Help to Buy could lead to falling demand for homes or lower prices, which could hurt the group’s balance sheet. Laith Khalaf, a senior analyst at Hargreaves Lansdown, said: ‘The market is worried about three things which are out of Barratt’s control – Brexit, interest rates and Help to Buy. ‘The end of the Help to Buy scheme is hovering into view, and unless the Government extends this in some form beyond 2021, that spells the removal of a key lynchpin in the new build property market. Barratt hiked its dividend to 43.8p, up from 41.7p the previous year. Investors set to cash in include Blackrock, Woodford Investment Management and David Wilson, the chairman of Barratt-owned housebuilder Wilson Bowden, who will pocket £7.8million. Thomas added: ‘The group has had another outstanding year delivering a strong operational and financial performance, and our highest volumes in a decade. Shares rose 1.8 per cent, or 9.6p, to 545.2p.